What do you get if you mix computers, electronics, amateur radio, science paraphernalia and lots of geeks? 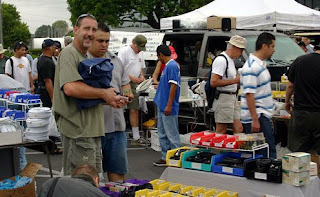 Easy, you get the TRW Swap Meet in beautiful Redondo Beach, California. The swap meet is every last Saturday of the month from 8am until 11am. It is located in the Northrup Grumman Space Technology parking lot near the corner of Aviation Blvd. and Marine Ave. I like to go a few times a year to pick through all the latest cool junk on sale such as used computers, components, tools, cheap CDs and DVDs, batteries, old test equipment like oscilloscopes, old lab equipment like microscopes, printer cartridges, and many surprises. I go to the swap meet for a few reasons. First, it is a great place to buy my supply of batteries. Several vendors supply batteries of all types, including cell phone and camera batteries. I also go looking for books. One vendor in particular, brings hundreds of older, but still useful, science and math books. In the past, I’ve found some real gems like the 1st edition of the Halliday and Resnick physics text I used in college but unwisely tossed after graduation. I also found some great books on partial differential equations, statistical inference, and laser optics. For five bucks a piece, it is well worth the trip. On one visit I found a very cool digital circuits breadboard lab kit that I enjoy playing with. And then there is one vendor that just specializes in soldering equipment, tools, and accessories which is very handy for building my physics experiments. The swap meet is entertaining for other reasons, namely the odd characters I encounter. There is a whole cast of regulars, so if you’re into geek-watching, this is the place for you. There is the “fallen body builder,” a snake-oil type salesman, about 6’2”, 250lbs. with bulging muscles that have seen much better days. He sells miscellanea such as digital meters, gloves, antennas, screwdrivers, etc. and he always drives a hard bargain. Then there is “the thing from Japan” a scruffy 4-foot man, or woman (really can’t tell), who speaks no English and spreads out a handful of ridiculous items like a rusty hammer, dirty power adapters, bars of soap, pens without their caps, and worn out bungee cords. I stand back to watch him/her like a train wreck. There is also the “gangrene man,” a long-haired, rotund, middle aged man who rides around in on electric scooter wearing just a hospital gown. For at least a year and a half now, one of his legs has been in a corroding cast with purple toes hanging out. It is a pretty disturbing sight. I also go to the swap for a quick burger breakfast at the Daughters of Job U-haul truck set up with an outdoor barbeque to grill their self-proclaimed “Best Hamburgers in the World.” And every once in a while, I run into old acquaintances like Mike Stein, a guy I remember from the UCLA Computer Club circa 1978. He hasn’t changed a bit, still squinting through coke bottle glasses, a very brilliant guy with a Peter Pan complex who never got another job other than working at the computer center at UCLA. OK, this I have to see for my own eyes! I love to geek watch. Thanks. I go often with my geek boyfriend, It is so funny you mentioned all the people I get scared when I see. One of my favorites is the 4ft Japanese man, I think he has to be kidding when he puts out those odd items for sale. I may get daring and actually buy one of his items to see if he can speak. I am looking for a Microsoft Word or office program for a 1992 Mac Classic. Alternatively, I would like to find someone who can help me read my 1990-1992 Macintosh disks. I have files of a book that was edited out by my publisher, and would like to use them now.